Even though I am not eating a lot more now that I’m pregnant, I am eating a lot more often! I used to just do three meals a day and a snack or two and now I’m finding it better to eat every couple of hours. When I was experiencing “morning” sickness in the first trimester, eating a little bit every couple of hours kept me from feeling nauseous. Now that I’m past that and into the second trimester, I’m finding I feel hungrier faster if I don’t eat every couple of hours and that a nighttime snack keeps me from waking up with a growling stomach at 3 a.m. So let’s get into some of my favorite snack foods so far in pregnancy! What Do I Eat Before Workouts? 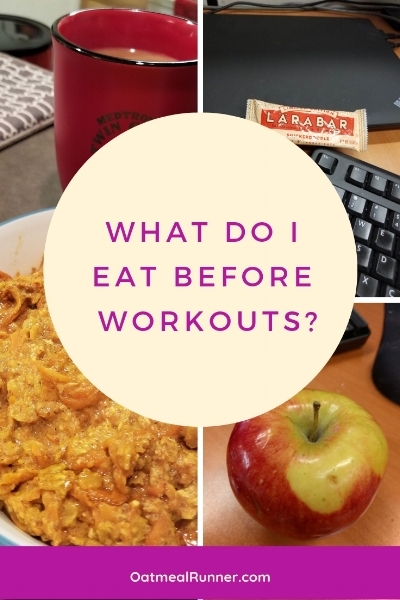 It took me a while to figure out that I should be eating something before I work out (unless I’m doing an early morning run) and the a little bit longer for me to figure out what works best. Today I’m sharing what foods work best for me in different situations and why I think they work for me. This is my typical pre-run food when I’m running after work (at about 4 p.m.). It’s the perfect way to get in some fast digesting carbs in about 45 minutes before my run to make sure I’m not going to be feeling weak or lethargic before or right after my run. 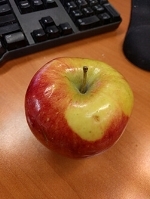 My go-to fruit is usually a banana or apple since they are easy to throw into my purse and I can buy enough for a week at a time without worrying about them going bad. One thing I found didn’t work pre-run was having some Greek yogurt with my fruit. That made my stomach feel upset pre-run and I’ve ended up cutting out eating dairy on a regular basis since it generally doesn’t agree with my body. For my cross training days, I like to eat a little bit bigger snack than just a piece of fruit because I tend to work out for longer (and later) so I need more fuel to make it through my workout. Bars are the easiest thing I’ve found that give me more calories (adding in some fat and protein instead of only carbs like my pre-run snack) to keep me full for longer. Some sort of bar fulfills this while (again) being easy to throw in my purse. 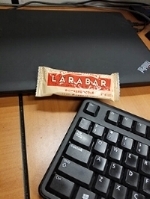 Currently, I’ve been on a Larabar kick (I might have bought three boxes of their fall/winter limited edition flavors) but RXBars offer a similar nutritional profile and have worked well for me. 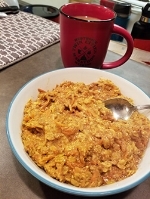 If you’ve spent any time around this blog, you’ll probably realize that I love oatmeal so much. It’s my go-to breakfast every morning and works really well as a pre-run meal on the weekends. I usually eat about 2-2.5 hours before my weekend runs and oatmeal gives me the perfect mixture of carbs, fats and proteins to be fueled for a longer run (right now between 5-10 miles, sometimes a pace run) without it being too heavy in my stomach. I’m not doing 5 a.m. runs anymore since it’s dark and cold during the fall mornings but when I was during the summer, I didn’t eat anything before heading out the door. I did drink a glass of water but otherwise there wasn’t anything in my stomach. I wasn’t doing long runs on these days (only 3-4 miles) so I was fine waiting to get home to eat. Plus, I didn’t want to get up any earlier than I already was to eat something and let it digest before my runs. Today is National Junk Food Day and that is right up my alley! I love my sweet treats and have been finding ways to fit them in to a healthier lifestyle. 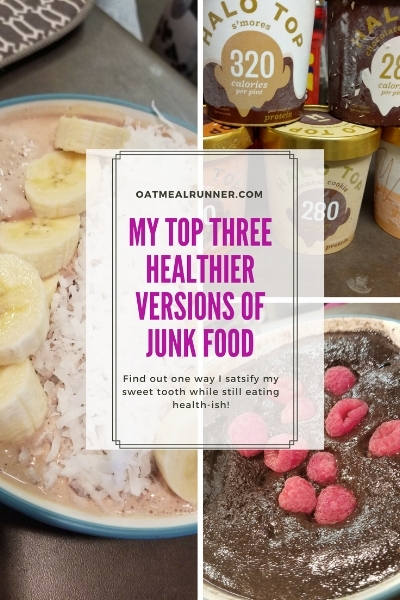 My current favorite is finding (or making) healthier versions that might have higher protein, lower fat or fruit/vegetable servings hidden in them. So today I’m sharing my three favorite ones on the blog! With how hot it is outside, smoothie bowls are my go-to post-workout or afternoon snack! They are cool, refreshing and super customizable. I’ve been loving mine with mini chocolate chips and coconut flakes on top. Plus I can sneak in a serving of fruit and vegetables along with a punch of protein to keep it on the healthier side. For a while, this chocolate lava cake was my go-to. Even though it’s been replaced by the smoothie bowl because of the summer heat, I still love a lava cake and whip one up every once in a while. Again, it’s super easy to customize depending on what I have on hand and what I feel like plus I can get in a serving of fruit too. I haven’t been brave enough to try vegetables in with chocolate but I bet a vanilla version with shredded carrots would be awesome! If I don’t feel like making something, my favorite grocery store finds are ice cream alternatives. They were also great during marathon training because they were higher in carbs and some days I needed them to get in enough carbs. 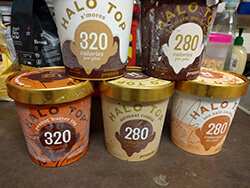 I started out on Halo Top (love the Pumpkin Pie flavor!) and I’ve also enjoyed Bryer’s Delight and Enlightened but all three of those brands can be pretty pricey for a single pint of ice cream. What I’m loving now as a cold treat is Yasso Greek Yogurt bars! Let me know what your favorite healthier junk foods are in the comments!